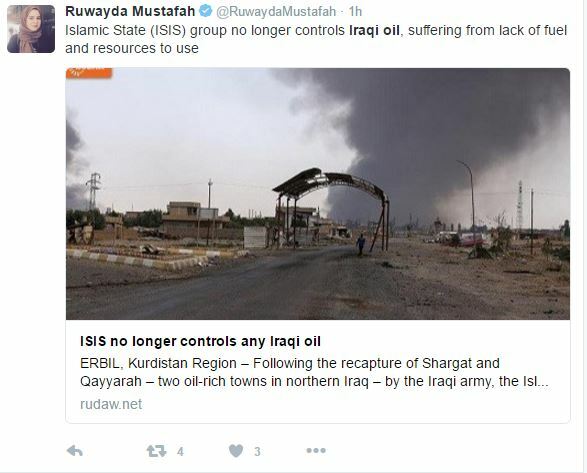 ISIS no longer holds control over any oil sources in Iraq. The terrorist group has completely lost control of all Iraqi oil fields and wells following the recapture of the oil-rich towns of Shargat and Qayyarah by the Iraqi army. The terrorist group must now rely on other resources to fund their terrorist activities after nearly two years of operating several oil wells in Iraq. The terrorist organization is believed to have a small amount of Iraqi oil stored away in off-site containers but lost access to the nearly 62 oil wells and 5 billion barrels of oil in underground wells. Kurdish Peshmerga forces have also driven ISIS out of the Hamrin and Hijel oilfields, further limiting their access to the profit producing liquid. Iraqi and Peshmerga forces have been slowly chipping away at one of the terrorists organizations main source of income for years. The revenue generated was used to fund their rapid expansion through large areas of northern and western Iraq. It is believed that ISIS earned approximately $750,000 a day and $22.8 million dollars a month through extracting and smuggling crude oil. ISIS has also raised the price of its remaining oil and increased “taxes” on local residents to compensate for the loss.